I thought I would have the patience to write this post this morning — CHAMPIONSHIP SUNDAY! — but I was wrong. Very, very wrong. Goes off, checks Twitter for the 10,000th time this morning for player updates. Where was I? Yes! Post! Recipe of the day you can make for the Super Bowl! Or any other football game! Or even a movie night or cocktails with friends. Anytime you need something cheap and easy as a Rex Ryan foot joke, really. If you ever read up on puff pastry, you will find most serious chefs will lecture you on the benefits of using all-butter — most types in the grocery store have lots of filler ingredients — puff pastry. But the brands they usually recommend costs about $15 a pound. Unreasonable. 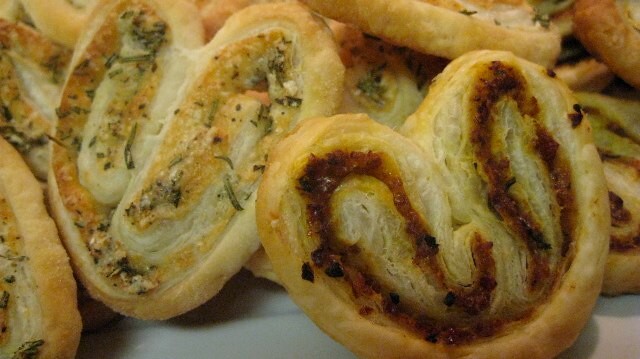 So here’s a little tip: Trader Joe’s brand puff pastry is all-butter and only costs a couple of bucks. And from my experience working with both the expensive and the bargain pastry, you won’t know the difference. 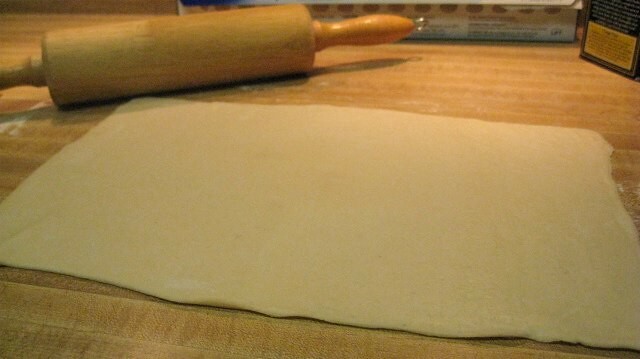 On a lightly floured counter or board, gently roll the puff pastry so it’s now a rectangle and not a square. 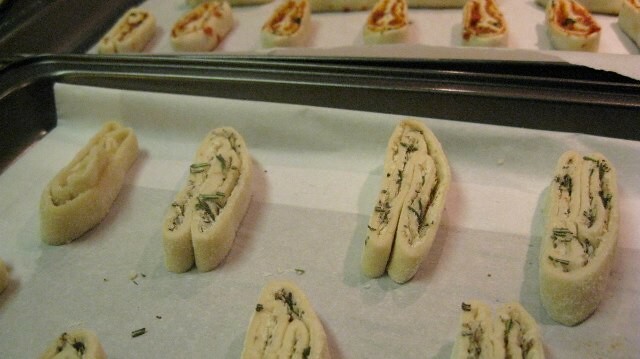 And with a very light hand, sprinkle one sheet with your cheese and herb filling over one sheet of puff pastry. Very, very thin coating is what you’re going for or you will bog down your pastry. 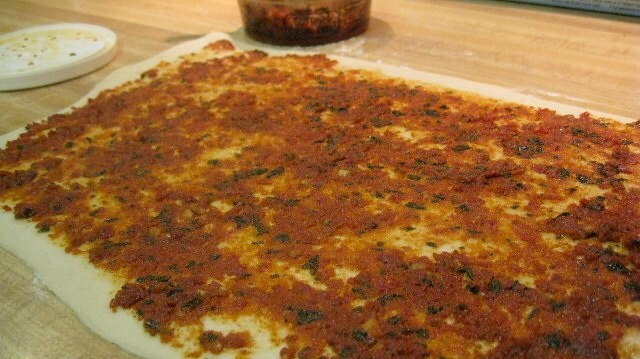 And on the other sheet, a nearly-transparent layer of sun-dried tomato pesto. You can also put cheese on this one too, but really it doesn’t need it. 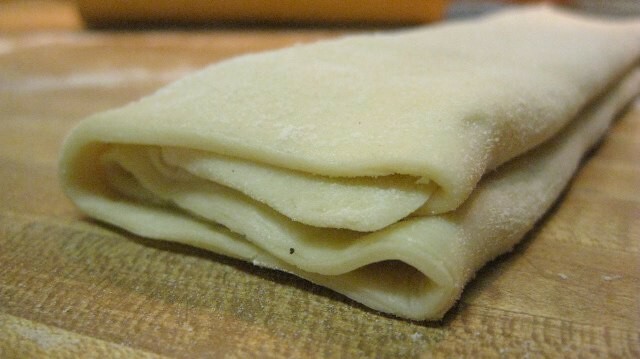 Fold the edges of the pastry in about 1/4 of the way to the center and then fold again so the two edges meet in the middle. And then fold over again like you were closing a book. 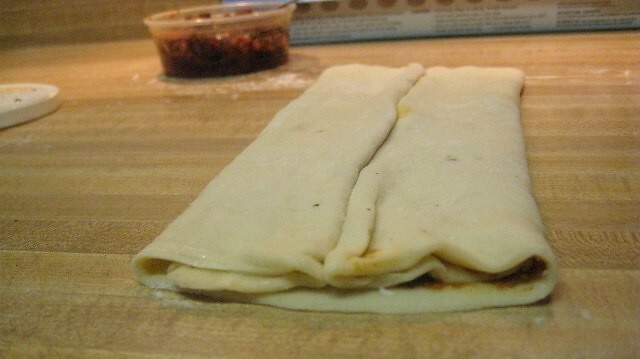 Some people just take the pasty and roll the edges in from both sides too. Non-conformists pastry rollers. 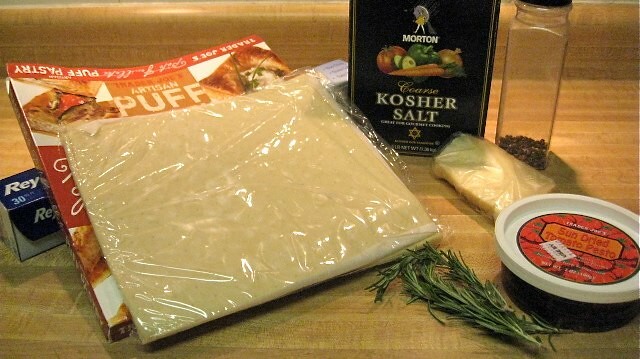 Cover with plastic and freeze for about 30-45 minutes, just enough time for everything to set for easier cutting. 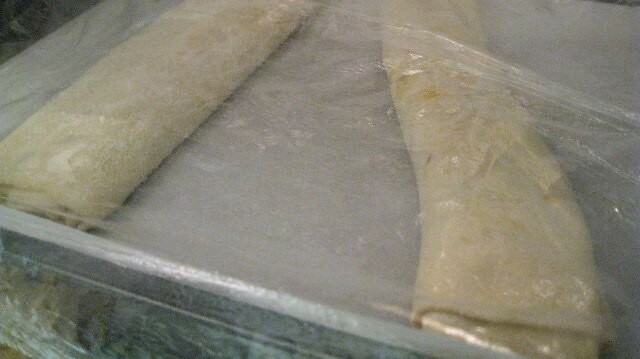 If you are making these ahead of time, flash freeze like this for 30 minutes and then wrap very tightly in plastic. Can be made up to a week ahead of time. 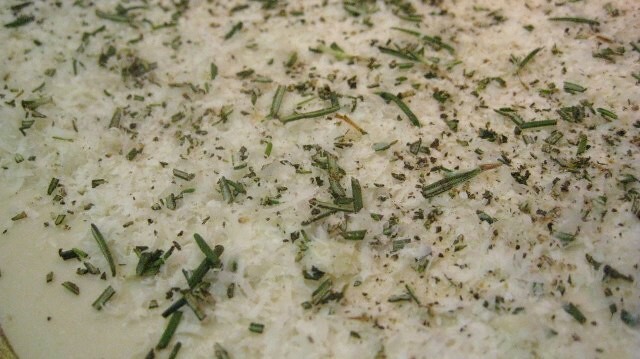 Cut into 1/4-1/2 inch slices and set on a lined cookie sheet, filling side up. Make sure you leave a couple of inches between each one so they have room to puff. Bake at 400º for about 10-15 minutes on the middle rack until golden brown. Be sure to keep an eye on the tomato ones, because if left in too long, they will burn a bit on the bottom. BLACK AND YELLOW BLACK AND YELLOW BLACK AND YELLOW! 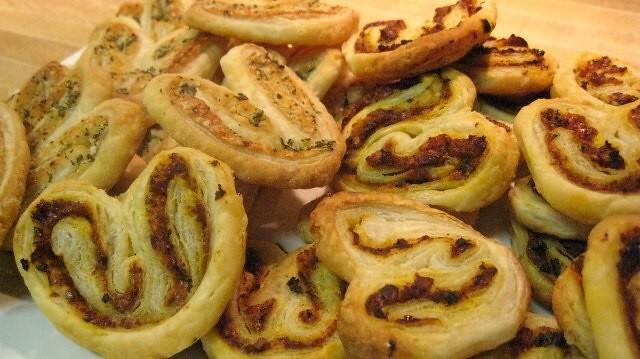 I have leftover puff pastry (pigs in blankets for dinner WHOOP WHOOP) so I’m using the extra half sheet for rosemary-thyme-Locatelli savory palmiers. Wish me luck!